Nimble's 180 gram stout CROSSWIND rear track hub has a 6061-T6 alloy shell body with an oversized wheelbody flange for maximum torque transmission. The drivetrain cog threads are standard 35x1 mm right hand while the safety lockring is 33x1 mm reverse left hand. A durable stainless steel reverse lockring is included. The hollow steel axle is 10x1x158 mm. The dropout interfaces are steel and spaced 120 mm standard. 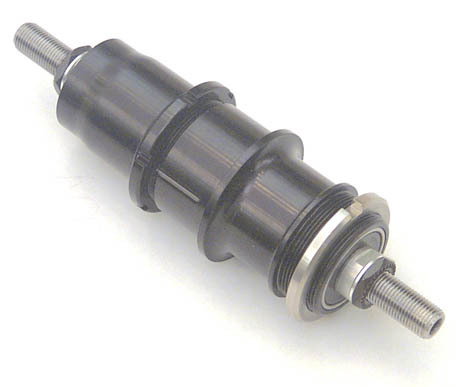 The dropout can be factory or rider adjusted to 130 mm (to accommodate road bike frame geometry) by replacing the axle with a 168 mm length, and adding 5 mm spacers. Axle lock nuts are available separately. See CROSSWIND front and rear hubs and pricing.